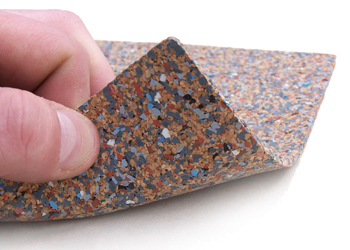 Isorubber Top is produced using recycled rubber and cork to form a resilient mat that can be glued to concrete floors to effectively absorb impact noise. 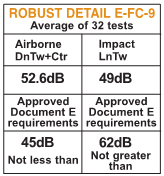 It has been rigorously tested and complies with both PART E and Robust Detail E-FC-9 & 10. Installing Isorubber Top is the one of the easiest solutions to comply with current soundproofing through separating floors requirements. Any floor covering can be fitted on top of Isorubber Top including engineered wood floors, carpet and laminate floors. Carpet and ceramic tiles can also be fitted as long as our MDF6 thin flooring is glued to the rubber first. 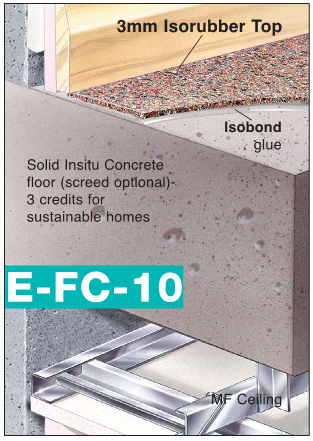 At only 3mm thick, the Isorubber Top is an easy to install, impact noise absorbing floor treatment that can be used to bring concrete floors into compliance with Robust Detail and Part E for separating floors. Using the adhesive we can supply, the product is simply glued to the floor’s surface ready for testing if required or installation of the final floor covering. Isorubber Top can be installed into newly constructed floors or used to comply with change of use regulations for noise control through separating floors. No special training is required to install. The product is simply glued to the top if the floor once it has been swept clean. 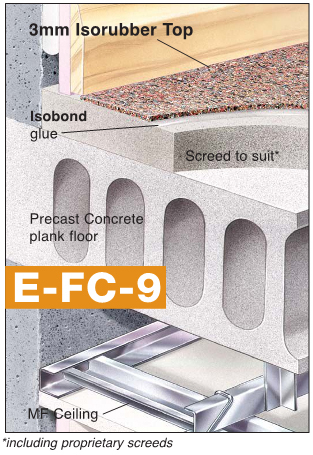 At only 3mm thick, this product is an inexpensive, easy solution to bring separating floors into compliance with both Robust Detail E-FC- 9 & 10 and Part E for impact noise reduction. In addition, the product can also be used beneath many types of underflorr heating systems. Due to its recycled formulation using waste rubber from the medical industry along with cork granules from sustainable trees, Isorubber Top has got to be one of the greenest products that can be used in the construction industry. This is because rubber consigned to landfill takes many years to degrade so is far better utilised where it can be put to good use to help people enjoy a quieter, long term benefit. 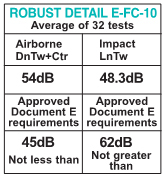 a) High impact noise absorbing performance and stability. b) Can be used with a wide variety of floor coverings. c) Extremely durable to foot traffic.